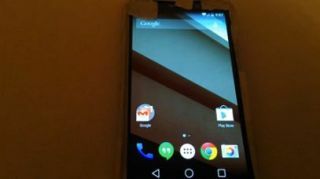 Is this mystery phone running Android L the Moto X+1? Tell me who you are! Android L's release is still a few months out for the general public, so at this point we're happy to catch any glimpse we can of Google's new OS. This includes when Android L appears in a video running on a mysterious Motorola device that even the person leaking the footage can't identify. TK of TK Tech News says in the video that he received images of the mystery 1080p handset from an unidentified tipster, and that he's not entirely sure what it is. "Maybe it's a test device," he speculates. "I can tell you it's a lot bigger than the Moto X, and I can tell you it's bigger than the Nexus 5." That puts it upward of 5 inches - exciting indeed. TK also speculated that it might be one of three new Droid phones scheduled to hit Verizon this year - the mysterious Android L phone in the photos is running on Verizon - or a variant of the Moto X+1, also coming out this year. There's no way to know until the techie grills his source a little harder, but in the meantime at least we can ooh and ahh at the possibilities. The phablet in question does sport the new Android L icons, as well as Android L's new navigation buttons. Of course this could all be a really pedantic hoax, though TK swears "it's legit." Until we find out either way, we'll be watching out for Motorola announcements.